My littlest one has inherited my love of singing. When she was around 4 or 5, we were at a neighborhood party and there was a karaoke machine. The other kids played around with it, but when Natalie got the microphone, she started shouting out to the crowd to get their attention. "Come on everybody! Put your hands together," she yelled. And then she started belting out whatever song it was at the top of her lungs. I, of course, was very proud! She often sees me playing Singstar on Playstation and she'll sing along with me. But now she has her very own songs to perform with the Sing Along With Barbie DVD. How perfect that one of her favorite childhood toys can now serve as her singing partner?! The DVD features 12 songs from popular Barbie movies of the past (also perfect, since Natalie loves and has watched each one). Easy-to-follow lyrics play on-screen on the off-chance your child doesn't remember the words. Whether your child likes "All for One" from Barbie & The Three Musketeers or "We're Gonna Find It" from Barbie & The Diamond Castle, they will find extended versions of many Barbie favorites to turn into family room performances. 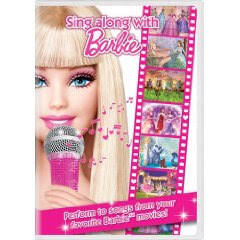 Sing Along With Barbie makes a perfect gift, especially for those hosting slumber parties. Click here for more information and/or to purchase. I have a brand-new copy of Sing Along With Barbie to giveaway to one lucky reader. To enter, simply leave a comment on this post. Be sure that there is an email address for you that I can find, or your entry will have to be disqualified. Deadline to enter is 11:59 EST, Tuesday, March 2, 2010. Winner will be selected at random using Random.org. Good luck! Our granddaughter would love to have this. She adores all things Barbie. Liz loves Barbie and singing so this would be a hit with her. My daughter loves Barbie and would love this! Thanks for the chance. My youngest daughter would like this. Thanks. oh my goodness please pick me! My daughter is a HUGE Barbie lover and loves karaoke as well!! I would love this for my daughter who is a big Barbie fan. Thanks for the chance. My three year old granddaughter would love this. She loves Barbie and music! This looks like a great DVD! My nieces love Barbie and love to sing so I know they would love it! I would love to win this for my 6yo. She is BIG barbie fan and owns most of the barbie movies. She would love this. My girls would absolutely adore this dvd! They love Barbie and they love singing (they are singstar fanatics!) so it would be a great things for them! My nieces would love this, we sing Barbie songs all the time. My daughter loves Barbie and she would love this. Would love to win this for my daughter. She likes to watch a movie before going to bed and this was be a pleasant change from the same ones she watches over and over. This would be a great way to introduce my toddler to Barbie. I know some girls that love Barbie and would love this. My 6 year old daughter LOVES Barbie. In fact, I have a video on my blog (http://mom2ways.com) with her singing along to the Barbie.com website. (She had headphones on). my two girls would love this, they are constantly singing all of the Barbie songs anyways so this would be perfect. My youngest would be all over this!! i would love to win this dvd for my little girl! My 3 girls love singing and love Barbie - this would be perfect! My daughter loves Barbie and singing ... what could be better? How adorable. My cousin's little girl would love this.